Do you have problems with your dressage and flatwork? Does your horse gradually “steal” the reins through your contact? Does your horse pull the reins through your fingers every time he jumps? 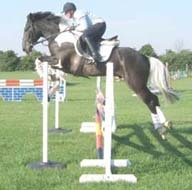 Do you get to the end of a grid or a course of show jumps with reins like washing lines? Is your horse in charge of the pace and steering? Is it impossible to ride a good corner because your horse leans in? Is it difficult to contain all the energy with a consistent contact? If you slip the reins, do you have to fumble for ages before you gather them up again? If the answer to any of these questions is “YES” the Mailer Bridging Rein will provide a very simple solution. If you accidentally drop a rein, is it easy to retrieve? Can you open a gate without dropping a rein down the horse’s shoulder? Can you ride on the flat for 5 minutes without adjusting your grip? Can you maintain your horse’s impulsion EASILY? If you’ve answered “NO” to any of these questions the Mailer Bridging Rein will once again provide the solution. My only regret is that I never designed the reins sooner, the use of my training voice would have been halved! No more shouting shorten the reins! No more shouting pick up the contact! No more shouting take more outside rein! No more shouting be consistent with your hands! NO MORE SHOUTING KEEP HOLD! !